Nobody’s complaining about cheap airfares. Especially when those airfares are to previously-cost-prohibitive international hotspots like Milan or Madrid. But with so many cheap international flights comes more people in the airport, and longer lines at customs and immigration. And as anyone who’s spent an hour shuffling through an immigration line after a 12-hour flight can tell you, customs can be a painful final hurdle before you get home. The new Automated Passport Control (APC) kiosks help a lot: They streamline declarations forms for US citizens and residents, Canadians, and certain visa holders. Show up at a busy time at a big airport, though, and the line to use the kiosk can take half an hour. There’s also Global Entry, but if you don’t have time for the interview (or you have a misdemeanor on your record), it ain’t happening. 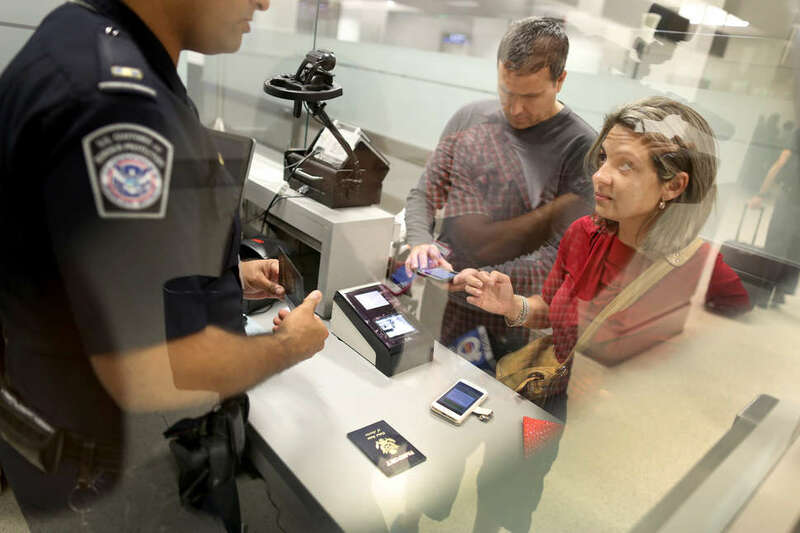 How does Mobile Passport Control work? Ordering from a McDonald’s touchscreen menu is more complicated. First, go to your app store of choice and search for the Mobile Passport Control app. Once you’ve downloaded it, it’ll ask you to complete a profile: name, passport number, gender, country of citizenship, and birthdate. It’s all encrypted, so no security worries there. Next, it’ll ask you to take a picture to have on file. If you’ve ever taken a selfie, this should be easy. If you’re doing this for your grandparents, maybe snap the picture for them. Then, once you’ve landed safe and sound in the good old US of A, turn your phone on, open up the app, and select the “New Trip” section. It’ll ask for your arrival airline and port of entry, and if you have any goods or cash to declare. Once you’ve filled that out, the app gives you a QC code to present at immigration. Sounds like a digital version of that blue form that has everyone on the plane asking to borrow your pen, right? What’s so special? Well, once you get off the plane, that’s where the magic happens. As the masses file through the airport toward the slow-moving APC kiosk line, you and your mobile phone follow the signs for Mobile Passport Control. 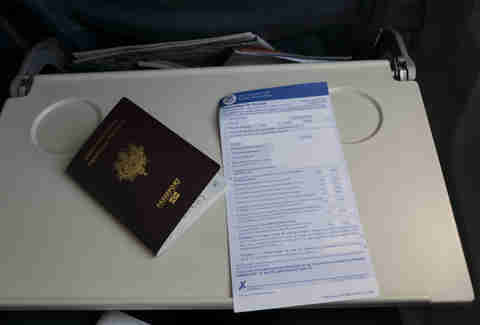 If someone tries to direct you elsewhere, tell them you have Mobile Passport, and they’ll point you to the right line. The line is typically next to where diplomats, celebrities, and other “lines are for peasants” folks go through immigration. If there’s more than three people there, it’s a busy day. Even those smug Global Entry people will probably wait longer. Show your QR code to the immigration officer along with your passport, answer whatever pro forma questions he or she has, and off to baggage claim you go. Didn’t check a bag? You’re home a good 30 to 60 minutes earlier. Why's the passport app so fast? Simple: People don’t know about it yet. That may change as word gets out (sorry), but for right now so few people are using Mobile Passport the lines are gleefully short. Who can use the passport app? Unlike the APC kiosks, Mobile Passport is only open to US and Canadian passport holders. Legal residents and certain visa holders who can use APC aren’t eligible for this yet. For most American travelers, you’ll be able to cover your whole family with the app. Much like with those old blue forms, you only need one per household and can enter up to 12 people. How much does the passport app cost? Nothing. Well, technically your taxes pay for it, so go get your money’s worth. Where are these magical Mobile Passport lanes? The app is used at 24 major US airports, as well as Port Everglades if you’re cruising out of Fort Lauderdale. You can see the full list of them here. 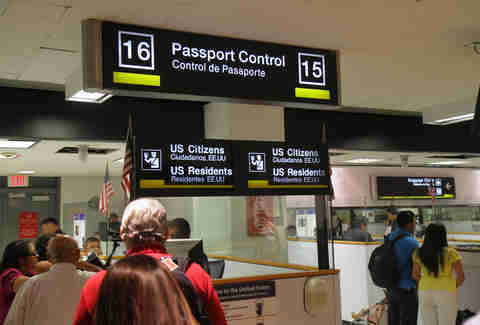 It is NOT accepted, however, at international airports where you clear US customs prior to departure. This includes most Canadian airports, Dublin, Aruba, and some others. It may expand further in the future, but currently all the big US airports of entry participate. 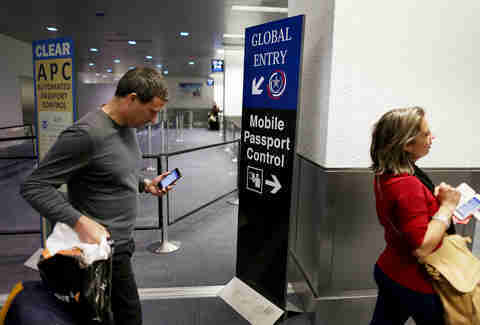 This is not to say that Mobile Passport Control will be the express lane into America for its citizens forever. And it’s not a way around any screening or inspection, so don’t think you’ll be bringing home some agricultural souvenirs from Jamaica just because you have a cool app: Your luggage is still subject to inspection. But if you’re new to overseas travel or a salty vet who just wants a quicker way home, it’s a great hack that saves time and stress. Matt Meltzer is a contributing writer to Thrillist who feels a little cheated he spent all that time getting Global Entry. Follow him on Instagram @meltrez1.